The Miller Theatre at Columbia University, under the régime of George Steel, consistently shows an unusually enlightened approach to producing concerts. Instead of just relying on repertory and performers to do all the work, they show an intelligent awareness of the component that place plays in a musical event. They have been producing, besides their showcases of new music (like the stunning all-Salonen evening) and standard repertory in the Theatre itself, other performances on the campus and off. There are smaller concerts in the chapel of St. Bartholomew’s on Park Avenue and Casa Italiana at Columbia, large choral works at the Church of St. Mary the Virgin (like an exquisite Robert Parsons evening in December), and the resourceful use of other venues, either repeated or one-off. They are in the vanguard of experiments with the old Park Avenue Armory as a mega-concert space, which Gérard Mortier has said he hopes to use for Messiaen’s St-François d’Assis. We owe them a lot for all this. 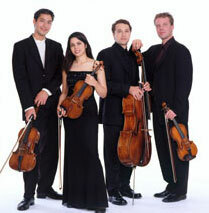 Miller is currently presenting the multi-award-winning Pacifica Quartet in the complete quartets of Beethoven. The programs are presented during the lunch hour in a visually nondescript but dignified room that rejoices in the imposing name of Philosophy Hall. The space has lively salon-like acoustics, Siamese prayer panels on the walls and a random Lachaise-like sculpture, among the usual computers and files. In other words, it’s a perfectly normal academic environment where people are encouraged to bring their lunches. The only thing I saw being consumed was Shakespeare’s food of love, but there were plenty of other evidences of the comfort people felt in being so close to what was, in the event, superior music-making. The chairs were in the form of a square C, with only four rows of them, but with standing-room to the full extent that floor-space allowed. The players were seated on a platform at one of the long walls of the rectangle. I heard the concerts given today and yesterday. The repertory was Opus 95 (the “Serioso”) yesterday and Opus 132 today (the one with the Heiliger Dankgesang). The crowd was even thicker than yesterday’s snow or today’s downpour of rain. I learned a lesson yesterday by not coming early. I had to stand for the program. Next to me was an exceedingly well-behaved four-year-old who alternately sat on the floor and stood to see, both with rapt attention that would have done credit to an aged savant. Because that’s the kind of music-making that we heard: music that commanded attention. On each day we had an oral introduction from a different member of the quartet (both charming and helpful but different from each other), the players were efficient at playing examples to illustrate the remarks (not an easy task, as you’ll know if you’ve ever had to coordinate that), and they showed themselves incapable of playing any way but expressively. Even the odd scale played as demonstration of a point was shapely and was, well, music. While a lengthy series of such major works will never be quite as supremely polished as, say, a much-repeated touring concert program, the performances were remarkable for, for example, the kinds of perfectly-tuned unisons and octaves that were, alas, missing at the Met Opera last night. Andrew Porter, long ago in The New Yorker, made a point I’ve never forgotten. He said that sometimes chamber music (I believe instancing Haydn) is best heard at home beside the stereo with a glass of sherry at hand. His point of comparison was the usual concert-hall performance of chamber music. I agreed with him then and do so now. But occasions like the ones I attended this week remind me why a good stereo is not only matched but exceeded in intimacy and excitement by the right room and atmosphere. (Even the lack of sherry may be transcended.) Not only is there the spontaneity of a unique moment, but there is something else that should never be minimized in its importance: the irreplaceable comprehensibility that goes with directional hearing. In a previous post, I talked a little about the importance of stereo-like effects in the Baroque concerto. But it is just as great, if less clear-cut, in other music. It is infinitely easier to absorb the content of music when you can hear the instruments’ separate lines separated instead of as one blended mass. Directionality also adds to sheer excitement. This is one of the reasons why wholesale amplification on Broadway has severely emasculated the effects of musicals. And I can’t tell you how disturbing I’ve found even the mildly “enhanced” sound at the New York City Opera, where not only is directionality compromised but attacks to a chord are sometimes heard twice — once from the speakers and then from the stage or pit. Fie! Miller Theatre and the Pacifica (and Beethoven) are to be congratulated on making the most of their freedom from any such disadvantages. You can hear their next batch of quartets on February 25, 26, and 27 — if you can get in.